U2 3D depicts a U2 concert in Buenos Aires during the band's Vertigo Tour. In the beginning of the film, a voice is heard chanting "everyone" in a crowd-filled stadium, followed by fans running through the venue. U2 begin the concert with "Vertigo", followed by ten more songs in the main set. Images are shown throughout the concert on the stage's LED display. Political and social statements are made during some songs, including "Sunday Bloody Sunday"—during which the word "coexista" is spelled out on-screen through various religious symbols—and "Miss Sarajevo", during which an excerpt from the Universal Declaration of Human Rights is read aloud by a narrator. The main set ends with "One", after which the group leave the stage. They return for an encore and perform "The Fly", during which a succession of words and phrases appear on the stage's LED display and are superimposed into the film. U2 end the show with "With or Without You" and leave the stage for the final time. As the closing credits begin, a live performance of "Yahweh" is heard as animations from the stage's LED display are shown. U2 reappear on stage in a mid-credits scene performing the end of the song. Producer Steve Schklair, pictured during filming, pioneered the 3D technology used in production of U2 3D. In 2001, producers Jon and Peter Shapiro created a 2D IMAX concert film titled All Access, which featured live performances of several musicians. Due to the difficulty of using conventional IMAX film stock that had to be replaced every three minutes of shooting, the Shapiros wanted to use digital technology for their next project, which could easily be upscaled to the IMAX format without loss of quality. Noting how 3D films out-performed 2D films, they also wanted their next project to be in the IMAX 3D format. While looking for a new digital 3D technology medium, the Shapiros met producer Steve Schklair, founder of Cobalt Entertainment in 2000. Schklair had recently developed a digital 3D filming technique known as "active depth cut", which allowed for smooth cuts between shots that would normally not line up when filmed in 3D. This was done using motion control photography and real-time image processing to create a realistic 3D experience without subjecting the viewer to excessive motion sickness or eye strain. It was intended to be an inexpensive and effective way to shoot live events such as concerts or sports. With the help of John and David Modell, former owners of the Baltimore Ravens American football team, the digital 3D technology was tested at several National Football League (NFL) games in the 2003 season, including Super Bowl XXXVIII. Cobalt showed the footage to the NFL, hoping to create an NFL-based 3D IMAX film. While waiting for a response, the Shapiros proposed the idea of creating a 3D concert film for IMAX theaters. Although All Access had showcased several artists, the Shapiros now wanted to focus on a single act, and being U2 fans, suggested the band as a potential subject. Schklair felt U2 would be a good choice for the film due to their large concert setups and their constant movement while performing, both of which would provide good depth of field for 3D effects. Test footage for the film was recorded at a Vertigo Tour concert in Anaheim, California. The Modells' collaboration with U2 for the film was facilitated by their involvement with the band in researching LED display technology in 1997 for use at Ravens Stadium at Camden Yards. At the time, the only giant LED display in existence was being used by U2 on their PopMart Tour. To learn about the technology, John Modell toured with U2 on-and-off for a period of six months. During that time, he befriended Catherine Owens, who served as the group's art director since their 1992 Zoo TV Tour. Unable to contact U2 manager Paul McGuinness, Peter Shapiro instead proposed the idea to Owens. The latter was researching art content for the upcoming Vertigo Tour and thought the concept could be used to show 3D video as part of U2's concerts. Shapiro explained that the technology was not that developed and simply wanted to document the tour itself in 3D, but Owens was not interested in making a film of the band, fearing it would interfere with the tour, so she declined the offer. After Shapiro showed Owens the 3D footage of the NFL games, Owens expressed interest in directing the proposed film, despite having no previous experience. According to bassist Adam Clayton, U2 were not interested in making another concert film, but Owens "pushed it down [their] throats". Once the band viewed the test shots, frontman Bono expressed interest in the project and convinced his bandmates to commit. Since U2 had already experimented with video technology in the past, they were interested in the project as a technological experiment rather than a means to make profit, and as a means to share the live experience with fans who could not afford concert tickets. Pre-production for U2 3D officially started in early 2004, and the production was handled by 3ality Digital, a company formed from Schklair's Colbalt Entertainment and his partnership with the Modells and the Shapiros. Midway through the year, Bono agreed to let the 3ality Digital crew record test footage, which was accomplished using a single 3D camera at one of U2's Vertigo Tour concerts in Anaheim, California in March 2005. U2 were dissatisfied with their 1988 rockumentary feature film, Rattle and Hum, which mixed backstage footage and interviews with concert performances. The filmmakers decided that U2 3D would only have concert footage. The producers originally wanted to shoot in Los Angeles where all the filming equipment was located, but Owens and the band decided they needed a more enthusiastic audience. U2 ultimately chose to film in five cities in Latin America from February to March 2006, believing their absence from the region for eight years would foster an energetic atmosphere. The only one of the eight Latin American shows that was not shot was the first in Monterrey, Mexico. The project enabled U2 to share the outdoor stadium concerts with audiences in the US, where the band only performed at indoor arenas on the Vertigo Tour. Filming began with two concerts in Mexico City, Mexico (left), followed by two additional shows in São Paulo, Brazil (right). U2 3D's production featured the first 3D multiple-camera setup and was shot using every digital 3D camera and recording deck in existence. The crew had two days to set up the filming equipment before each concert, which required running optical fiber cables and hooking up an electrical generator to supply power at each venue. The filming equipment consisted of nine custom-built 3D rigs. The project's large scale prompted 3ality Digital to work with director James Cameron—their chief competitor at the time. 3ality used their own 3flex TS1 camera rigs for filming, in addition to five Fusion 3D rigs, designed by Cameron and camera operator Vincent Pace. A total of 18 Sony CineAlta HDC-F950 cameras were used for filming, with two cameras on each rig. The cameras were fitted with Zeiss digital zoom lenses, making U2 3D the first 3D film shot using a zoom lens. One of the Fusion 3D camera rigs was used as a Spydercam and became the first 3D aerial camera. The cameras on each rig were spaced eye-distance apart to create a 3D effect in post-production. Using a beam splitter mounted to the camera rig, one camera shot through a 50/50 mirror, while the other shot the image reflected from that mirror. Each rig weighed an average of 200 pounds (91 kg). All of the concert footage was shot with twin-camera setups, except for the two Melbourne shoots, where a single CineAlta camera with a Steadicam was also used to capture close-ups. The cameras captured high-definition video onto HDCAM SR recording decks, which enabled the crew to capture an entire concert. Five crew members were required to work on each rig simultaneously to ensure that the focus on both cameras were synchronized. After one camera was destroyed when a concert security guard tossed buckets of water onto the audience, the crew waterproofed the remaining cameras. Due to Owens' limited directing experience prior to production, some of the filming in South America was directed by Mark Pellington, who previously worked with U2 on the "One" music video. Pellington was not involved in post-production, leaving Owens responsible for the remaining aspects of the project, including creative direction and editing. The concerts were filmed in a style which Owens described as "very unorthodox"; no storyboards or shooting scripts were used to ensure footage of U2's performances was improvised. Instead of being directed, U2 performed each of their concerts as usual, with the filming crew capturing footage in real time for the full ​2 1⁄2-hour concerts. The shoots were planned such that the band's performance and the audience's view was uninterrupted. To avoid capturing other camera rigs in the footage, the crew would either film from the back of the stage, or alternate each night between shooting left-to-right and right-to-left. Several shows were edited together to create one performance; therefore, U2 were required to wear the same clothes every night to maintain continuity. Additional spotlights were focused on the audience during filming, and the lighting was dimmed on the stage's LED display. 110 microphones were used to record the concert audio, which included microphones placed on the main stage and around the two B-stages to record the band, and microphones placed throughout the venue to record the audience. Principal photography began in February 2006, under the supervision of the 3D cinematographer Peter Anderson; two shows were filmed in Mexico City to capture medium shots during a practice run for the crew to learn the choreography of U2's performances. The crew captured additional medium shots using two camera setups at the two São Paulo concerts, and captured overhead footage of drummer Larry Mullen, Jr. using a single camera setup at the show in Santiago. During preparations for the Buenos Aires concerts, U2 performed a 10-song set without an audience, so that the crew could capture close-up footage using a wide-angle lens; doing so in-concert would have interfered with the show. Owens dubbed the session the "phantom shoot". During the Buenos Aires shows, all nine camera setups were used, capturing shots of U2 from the B-stages. The Buenos Aires shoot was the largest of the project, requiring a crew of 140 people. 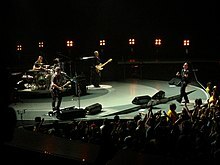 In March 2006, the remaining Vertigo Tour concerts were postponed when the daughter of guitarist The Edge fell ill. During the interim, footage from the seven filmed shows was edited together, prompting the crew to request additional wide shots from the back of the stadium and close-ups of the band members. When the tour was on its fifth leg in November 2006, an additional two shows were filmed in Melbourne to capture the extra footage. At the time, the songs appearing in the final cut of the film had already been selected and therefore only specific songs from the concerts were filmed. HDCAM SR tapes captured the footage which was later uploaded to computers for editing. Post-production began in February 2006 and occurred concurrently with ongoing principal photography. Editor Olivier Wicki led post-production, working closely with Owens; the two had previously collaborated on the "Original of the Species" music video. Over 100 hours of footage were filmed, featuring performances of 26 different songs. To appeal to a mainstream audience, 14 tracks were chosen for the final cut, including 12 of U2's singles and two non-singles from How to Dismantle an Atomic Bomb, the album that the Vertigo Tour supported. When selecting songs for the project, the crew had to ensure that the performances of each track fit with one another. U2 wanted to include "Mysterious Ways" and "Until the End of the World", but they were left out since Owens felt that those songs were out of place with the rest of the film. She stated that the main focus of the film was based upon U2's relationship with one another and with their audience, and the challenge of selecting the songs was to create a narrative within the band's performance. Although "City of Blinding Lights" opened most shows on the tour, "Vertigo" was selected as the opening song of U2 3D. Other tracks that were performed at most of the filmed concerts that did not make the final cut include "Elevation", "I Still Haven't Found What I'm Looking For", "Original of the Species", and "Zoo Station". "With or Without You" was chosen as the last song before the closing credits, although it closed only one concert on the tour. After the songs were selected, the footage was edited in 2D for eight months in New York City. Video post-production continued in Burbank, California at 3ality Digital's 3D production facility, which opened prior to the completion of shooting. Wicki worked with 3ality Digital to create the 3D and computer-generated effects. Footage from the nine filmed concerts, mostly from the Buenos Aires shows, was edited together with the footage from the "phantom shoot". Although the Mexico City shows were practice runs, footage from those concerts was used, including a scene where Bono reaches out to the camera during "Sunday Bloody Sunday". Because the crew felt the Melbourne audience lacked the energy of the Latin America crowds, most of the footage from the Melbourne concerts was not used except for some close-ups of Mullen. Creating the 3D effect involved taking the edited 2D footage for the right eye and matching it up with footage for the left eye. Editing the Melbourne footage that used only a single camera involved a separate process to create 3D effects, known as "virtual second eye perspective". Several software programs were used to convert footage from 2D to 3D. The primary editing software, 3action, was developed at 3ality Digital during principal photography. It allowed the post-production team to change convergence points in each shot, and to create multiple convergence points. Left-eye and right-eye footage was assembled on separate layers, then edited together with color grading added, and eventually output in a 3D stereoscopic format for review. A 2D screenshot from U2's performance of "One" shows how compositing was used to create layers during transitions between shots. U2 3D was the first 3D film to feature composite images with more than two layers. U2 developed a style of editing in their previous concert films that involved fast cutting between shots, which Owens wanted to retain in U2 3D. Because fast cutting in 3D would lead to motion sickness or eye strain, the film was edited to incorporate dissolves of at least four frames between shots. Many of the transitions were created by layering several frames of footage on top of one another into composite images. Each of the layered frames featured a different depth of field to enhance the 3D effects, and up to five images were layered together in a single shot. This made U2 3D the first 3D film to feature composite images with more than two layers, and the first to be edited specifically to prevent the viewer from experiencing motion sickness or eye strain. Software did not exist at the time to layer the 3D images, so new software had to be developed. Because the project was captured in high-definition video, each frame used nearly 20 megabytes of data on 3ality Digital's servers, and the entire film used almost a petabyte (1015 bytes). The 3D editing process took longer than Owens expected, and consequently, the project went over budget, costing $15 million to produce. Video editing took 17 months, and the final film was cut to a length of 85 minutes—seven shorter than originally announced. Audio editor Carl Glanville worked on the soundtrack, mixing the audio into a 5.1 surround sound mix with audio engineer Robbie Adams in New York City. Video footage was compiled into files by Wicki, which were given to Glanville for compiling the soundtrack. Glanville and Adams said the audio editing was difficult mainly because the selection of video footage was limited, as only one to two cameras angles were captured at most of the shows. Further, the lyrics and music from the song performances differed slightly each night. To avoid lip sync and instrumental sync issues, the editors had to use the exact audio that was recorded during each shot. Mixing the vocals required that Glanville layer the audio recorded from the stage microphones with that from the audience microphones and to add a short delay between the two to compensate for any echos or delay that occurred in the venue. The sound from the subwoofer channel was mixed inside two IMAX theaters in Los Angeles to ensure the volume of low-end frequencies was consistent with the rest of the soundtrack. The edited video footage featured 10- to 20-second-long shots, in contrast to the shorter shots usually found in concert films. Extended gaps were added between songs to slightly slow down the pace of the film. All audio and video footage used was recorded live in concert, with no added overdubs. Following post-production, U2 3D became the first live-action film to be shot, posted, and exhibited entirely in 3D, the first live-action digital 3D film, and the first 3D concert film. The film's logo featured the title in a stencil-like font, and was designed by creative director John Leamy. The trailer for the film was released and first screened at the ShoWest trade show in March 2007, along with footage of "Sunday Bloody Sunday". Clips from the "Vertigo" and "The Fly" performances were featured in the trailer, which was edited by creative director John Leamy, who also designed the wordmark logo and title sequence for U2 3D. The film poster, which featured a collage of images from the film, won Leamy an award for best poster art at the Giant Screen Cinema Association's annual international conference in 2008. The trailer was shown in 3D theaters before Meet the Robinsons, the only 3D film released in theaters in early 2007. Originally scheduled for the third quarter of 2007, the film's release was delayed when a distributor could not be found. In October 2007, National Geographic Cinema Ventures (NGCV), the entertainment division of the National Geographic Society, announced that U2 3D would be the division's first major international release. Two days after the announcement, NGCV was combined into the newly created National Geographic Entertainment, a new unit within the society featuring various entertainment divisions. National Geographic CEO John M. Fahey, Jr. stated that U2 3D was chosen as the new unit's first release because they felt that U2 is "a band of the world" and "world music is something the Geographic as an institution is really interested in". National Geographic chose Best Buy as the film's American sponsor, and offered passes to select members of the retailer's loyalty program to view U2 3D before its wide release. U2 3D was promoted through the internet, print, radio, television, on a JumboTron in Times Square, and as a sponsor on NASCAR's #19 Best Buy Dodge stock car driven by Elliott Sadler. U2 performed a brief set at the 2007 Cannes Film Festival prior to the film's preview screening. U2 were committed to preserving the film's 3D format and decided to only release it in digital 3D. To help promote this film format, U2 3D was first screened at the 2007 Cannes Film Festival on May 19, 2007. It was one of nine films to be screened out-of-competition at the 2007 festival, and was the first live-action 3D film shown at Cannes. Following a brief song performance by U2 at the festival, the film was screened at midnight inside the Palais des Festivals et des Congrès. At the time, the 3D post-production process was incomplete; therefore, a shortened, 56-minute version of the title was screened, featuring nine of the completed version's 14 songs. The completed version premiered at the 2008 Sundance Film Festival on January 19, 2008 at the Ellen Eccles Theatre. The theater incorporated a customized sound system designed especially for the premiere with new Dolby 3D technology, which John Modell referred to as "the most high tech film screening that's ever been done in history." U2 3D was slated to be screened only in IMAX theaters, but the large increase in the number of digital 3D theaters following post-production prompted the filmmakers to expand the release to include those cinemas. Two different types of polarized 3D glasses were used for the IMAX 3D and digital 3D showings. The IMAX 3D version of the film used glasses with one lens polarized horizontally and one polarized vertically, while the digital 3D version used glasses with two circularly polarized lenses. John Modell described the IMAX version as a "more immersive experience", and stated that the digital 3D version features more vivid colors. On January 23, 2008, U2 3D was released into IMAX theaters in the United States and Canada for its initial limited release. It grossed over $960,000 in the US during its opening weekend after playing in 61 theaters, and ranked at number 20 at the box office. The IMAX release took place much earlier than the film's wide release, as many IMAX theaters had booked The Spiderwick Chronicles, which was released on February 15. U2 3D was U2's second feature film, following 1988's Rattle and Hum, and the third concert film from the Vertigo Tour, following the direct-to-video concert films Vertigo 2005: Live from Chicago and Vertigo 2005: Live from Milan. The wide release was originally scheduled for February 15, 2008, but the date was pushed back one week when Walt Disney Pictures decided to extend its release of the 3D concert film Hannah Montana and Miley Cyrus: Best of Both Worlds Concert, which was initially scheduled to be in theaters for only one week. Instead, on February 15, U2 3D had a second limited release in select theaters in the US with RealD 3D technology. The film's European premiere took place on February 20 at the Jameson Dublin International Film Festival, followed by its international wide release on February 22. The first week of the wide release was the highest-grossing week of its theatrical run, grossing over $1 million at 686 theaters in the US and ranking at number 19 at the box office. However, comparing the box office performance of Hannah Montana and Miley Cyrus, The Spokesman-Review's online magazine Spokane7 said U2 3D was "failing miserably". Three weeks into its wide release, U2 3D was playing in less than 100 theaters throughout the US. At the time, it had grossed less than $6.6 million, while Hannah Montana and Miley Cyrus—still playing in many theaters since its February 1 release—had brought in over $60 million. The BFI IMAX in London was reported as U2 3D's highest grossing cinema, generating $442,127 (£223,235) from over 19,000 ticket sales in the first seven weeks. Prior to its Japan premiere in February 2009, U2 3D grossed $20 million in box office revenue. A re-release in the US took place in 2009 to coincide with the release of U2's studio album, No Line on the Horizon, followed by re-releases in Brazil and Spain in 2011 and 2015, respectively, prior to U2's concert tours in those countries. In addition to re-releases, the Rock and Roll Hall of Fame celebrated the opening of its new theater in October 2009 by featuring screenings of U2 3D at its museum. The film's box office run in the US ended August 26, 2010, bringing its total domestic gross to $10,363,341, after showing for 947 days. The film's distributors stated there was no predetermined limit to the length of the title's run, and the overall length would be determined by box office sales. Due to an open-ended theatrical run, total worldwide box office gross sources vary; website Box Office Mojo reported a worldwide gross of $22.7 million in December 2010, while magazine BoxOffice and website The Numbers list grosses of $23.4 million and $26.2 million, respectively. For its genre, U2 3D was successful and set several box office records. The film became the highest grossing documentary to be eligible for an Oscar nomination at the 81st Academy Awards. U2 3D set a record in Ireland for the highest screen average of any film playing during its opening weekend, and it took in €89,538 from eight cinema screens during its first three days. In February 2011, Forbes ranked U2 3D as the fifth highest-grossing concert film, earning $14 million more than Rattle and Hum, which ranked at number seven. The press release for the 2015 Spain re-release states that U2 3D has been licensed exclusively for theatrical release, and will not be distributed in television, internet, or other home video formats. Owens said in a 2007 interview that there are plans to release the film to a 3D home video format, however, U2 control the ancillary rights to U2 3D along with their record label Universal Music Group, and they have stated that additional rights such as those for a home video release will not be optioned until home video technology can meet the same digital 3D standards as cinema. Based on 88 reviews by critics, Rotten Tomatoes gave U2 3D a 92% approval rating, and ranked it the fourth-best reviewed film in wide release from 2008. The website assigned it an average score of 7.5 out of 10, with a consensus that U2 3D was "an exhilarating musical experience at the price of a movie ticket". At Metacritic—which assigns a normalized rating out of 100 to reviews from mainstream critics—the film received an average score of 83, based on 19 reviews, which translates to "universal acclaim" on the website's rating scale. The film received positive reviews from Toronto Star and Variety following its 56-minute premiere at the 2007 Cannes Film Festival when the final 85-minute cut was months away from completion. Critics from publications such as the Irish Independent, The New Zealand Herald, Reno News & Review, Toronto Star, and USA Today said that the film's 3D experience was "even better than the real thing"—a reference to U2's song of the same name. Reviews by Rolling Stone and Total Film stated the film seemed to appeal to fans and non-fans of U2 alike, just as the filmmakers had intended. The Edge and Bono (pictured in 2015) were both pleased with the outcome of the film. U2 3D was praised by Variety for its straightforward concert footage, compared to the interviews and behind-the-scenes footage included in Rattle and Hum. In an episode of the TV series At the Movies with Ebert & Roeper, Michael Phillips called the film "a genuine eye-fill" and Richard Roeper described it as "spectacular". The New York Times designated U2 3D as a "Critics' Pick" and stated in the review that the film was "the first IMAX movie that deserves to be called a work of art". U2 3D appeared on many critics' lists of the top ten films released in 2008 including The Austin Chronicle, OhmyNews International, Seattle Post-Intelligencer, The Sydney Morning Herald, and River Cities' Reader. The film was also ranked by Complex and Empire as one of the best 3D films. As the film has only been released theatrically, Den of Geek included U2 3D in a list of "15 movies that aren't on DVD but should be", stating that "no concert film [...] has ever come close to capturing the exact experience so accurately". Bono was satisfied with the outcome of the film and said his favorite sequence was the performance of "Miss Sarajevo". When interviewed about the PopMart Tour in 2009, Bono said that the PopMart: Live from Mexico City video was the best project U2 had done from an audio and visual perspective, and was "eclipsed only by U2 3D". The Edge was pleased that the footage did not show any of the distress he felt from his daughter's illness during filming. However, the film received more critical reviews. The A.V. Club graded it a B− and stated that U2's performance was less thrilling than the 3D effects. Online magazine FilmSlash criticized The New York Times' statement about U2 3D being the first IMAX art film, stating that some of the first IMAX titles were "experimental works of art". Music critic Joel Selvin wrote in the San Francisco Chronicle that seeing U2 on the big screen was "more distracting than illuminating", and Time Out London criticized Bono's political statements, stating he "should refrain from ramming his preachy political meanderings down our throats and let the music do the talking". The Daily Telegraph favored Rattle and Hum over U2 3D and called U2's performance "unexciting", criticizing how "the cameras, not the band, are doing all the work". The Guardian, which gave a rating of one out of five stars, claimed that U2 appeared to be "four conceited billionaires who are further up themselves than ever". U2 3D was recognized favorably after its release, earning several awards. In 2008, it earned three awards, including "Best Film Produced Non-Exclusively for the Giant Screen" at the Giant Screen Cinema Association's 2008 Achievement Awards, "Best Musical Film" at Los Premios MTV Latinoamérica 2008, and the Pioneer Award for Film & Television at the 2008 3D Film and Interactive Film Festival. In February 2009, the film received the award for "Outstanding Visual Effects in a Special Venue Project" from the Visual Effects Society (VES) at the 7th Annual VES Awards. A paradigm shift we talk about a lot is going from silent to talkies, or from black and white to color. We think [U2 3D] is a key change with regards to both digital delivery and also 3D. We all see in 3D in real life and every technological advancement in film has always been about bringing you closer and immersing you into the story or the emotion of what you're watching. The extensive use of technology during production was featured as the cover story in the December 2007 issue of the high-definition video magazine HDVideoPro, a month before the premiere of U2 3D. Its usage of evolutionary technology led to Catherine Owens being selected as a featured guest speaker at the SIGGRAPH 2008 conference, which took place several months after the film's release. After U2 3D received praise from fans, critics, and the film industry, several of the filmmakers stated that they felt it helped create a paradigm shift in cinema history, due to the technological advancements used in the production. Director Wim Wenders was inspired to create the 2011 3D dance documentary Pina after the attending the U2 3D screening at Cannes. The film's use of new technology inspired English rock band Muse to increase the production values for their 2013 release Live at Rome Olympic Stadium, which became the first concert film shot in 4K resolution. Following the success of U2 3D, 3ality Digital continued to pioneer 3D projects. After previously experimenting with filming American football games in 3D, 3ality Digital successfully broadcast the first live 3D NFL game in December 2008. In 2009, 3ality Digital aired the first live 3D sports broadcast available to consumers, the first 3D television advertisement, and the first 3D episode of a scripted television program. U2 show director Willie Williams recruited U2 3D director of photography Tom Krueger to design the photography and video coverage for the band's 2009–2011 U2 360° Tour. Krueger directed their subsequent concert film, U2 360° at the Rose Bowl, which was released in 2010. All titles written by U2, except "Miss Sarajevo" (co-written with Brian Eno). ^ Dierks, Stephen (February 2, 2008). "U2 comes to life in '3D'". The Daily Cardinal. Archived from the original on March 10, 2008. ^ McCracken, Brett (January 25, 2008). "U23D". Christianity Today. pp. 1–2. Retrieved January 7, 2013. ^ Lemire, Christy (January 22, 2008). "'U2 3D' immerses you in the band's music". Associated Press. Retrieved February 17, 2019. ^ a b Grimm, Bob (February 28, 2008). "Even better than the real thing". Reno News & Review. Retrieved January 8, 2013. ^ a b "Our History". 3ality Digital. Archived from the original on November 19, 2010. ^ Mendiburu, Bernard (2009). 3D Movie Making: Stereoscopic Digital Cinema from Script to Screen. Burlington, Massachusetts: Focal Press. p. 154. ISBN 978-0-240-81137-6. ^ a b c d e f g h "U2 3D Production notes" (Press release). National Geographic Society. January 16, 2008. Archived from the original (DOC) on December 23, 2009. Retrieved February 8, 2008. ^ Schiesel, Seth (January 29, 2004). "A Film Team's Super Bowl Test". The New York Times. Retrieved June 20, 2008. ^ a b c d e f Waful, Jefferson (January 23, 2008). "U2 3D: The Next Dimension – An Interview with Producer Pete Shapiro". Jambands.com. Relix Media Group. Retrieved April 10, 2019. ^ a b Dawson, Nick (January 23, 2008). "The Director Interviews: Catherine Owens, U2 3D". Filmmaker. Retrieved January 7, 2013. ^ a b Goldman, Michael (January 22, 2008). "Audio Podcast: U2 3D, Thanks to HD" (Podcast). Digital Content Producer. NewBay Media. Retrieved February 17, 2019. ^ a b c Cohen, David S. (May 18, 2007). "Dawn of a beautiful day for 3D?". Variety. Retrieved January 8, 2013. ^ Cunningham, Megan (February 13, 2008). "On the Circuit: Catherine Owens of U2 3D". Zoom In. Archived from the original (Podcast) on November 8, 2012. Retrieved July 25, 2010. ^ a b c d e f g h Karakaya, Jenny (May 30, 2007). "INT: U2 3D director". JoBlo.com. Retrieved January 8, 2013. ^ a b National Geographic Society (January 23, 2008). "U2 3D at Sundance 2008" (video). YouTube. Retrieved July 30, 2009. ^ a b Heron, Ambrose (March 8, 2008). "Interview: Catherine Owens on U2 3D" (Podcast). FILMdetail. Retrieved February 8, 2009. ^ a b Breznican, Anthony (January 22, 2008). "U2 writes Sundance soundtrack with new film '3D'". USA Today. Retrieved January 7, 2013. ^ a b c d e "Olivier Wicki: Interview". U2 Swiss Home. Archived from the original on March 14, 2008. ^ a b "'U2 3D' HD: Behind the Lens". Sound & Vision. February 2, 2008. p. 1. Retrieved February 17, 2019. ^ a b Wakelin, Simon (December 2007). "U2 Gets One with 3D". HDVideoPro. Los Angeles: Werner Publishing Corporation. 1 (4). ISSN 1936-3206. OCLC 85860687. ^ a b c Hayes, Brogan. "Interview with 'U2 3D' director Catherine Owens". Movies.ie. Retrieved September 7, 2015. ^ a b Mühlbradt, Matthias; Axver, André. "U2 Vertigo Tour 4th leg: Latin America". U2gigs.com. Retrieved February 10, 2008. ^ a b c "Bluerock announces U2 3D Preview Screening at Cannes" (Press release). DMN Newswire. May 14, 2007. Archived from the original on September 27, 2007. Retrieved May 15, 2007. ^ "3ality Digital to Sell Best-in-Class 3D Camera Rigs" (Press release). 3ality Digital. PR Newswire. April 17, 2009. Archived from the original on March 4, 2016. ^ "Revolutionizing the Experience: Unique. Engaging. Immersive". PACE. Archived from the original (PHP) on July 3, 2011. ^ a b "3ality Shoots U2 3D Feature Film". Creative Planet Network. NewBay Media. August 23, 2007. Retrieved February 17, 2019. ^ a b c d e f g h Kaufman, Debra (January 17, 2008). "Shooting a Concert Like No Other". Film & Video. Access Intelligence. Retrieved January 1, 2013. ^ "Hannah Montana Gets Added Dimension with the PACE/Cameron Fusion System" (Press release). PR Newswire. February 4, 2008. Archived from the original on March 4, 2016. ^ "Featured Benchmark: Music Videos". Pace. Archived from the original (PHP) on July 3, 2011. ^ a b c d e Geller, Rusty (December 2006). "My Long Weekend in Melbourne" (PDF). Focal Point. Australian Cinematographers Society. pp. 8–11. Archived from the original (PDF) on November 15, 2009. ^ a b c Creely, Niamh (May–June 2008). "Getting U in2 3D". Film Ireland (122): 22–25. OCLC 40491065. ^ a b c d Ben Block, Alex (January 25, 2008). "U2 Breaks the Rules In 3-D, New Software for Hard Rock". Hollywood Today. Angel Media. Archived from the original on March 19, 2012. ^ Mühlbradt, Matthias; Axver, André. "U2 Vertigo Tour 5th leg: The Pacific". U2gigs.com. Retrieved January 3, 2009. ^ Goldstein, Patrick (September 24, 2008). "Bono's hand almost poked out my eye: My continuing education in 3D". Los Angeles Times. Retrieved September 25, 2008. ^ a b c d e Hurwitz, Matt (March 1, 2008). "U2 3D". Mix. Retrieved September 7, 2015. ^ "Catherine Owens (U23D director) interview". RTÉ.ie. February 22, 2008. Retrieved April 27, 2008. ^ Fee, Gayle; Raposa, Laura (March 13, 2009). "U2 gig had Hub all over The Edge". Boston Herald. Retrieved January 8, 2013. ^ a b Sperounes, Sandra (April 23, 2008). "U2 film two years in making". Edmonton Journal. Archived from the original on January 20, 2016. ^ a b c "ShoWest gets peek at 'U2'". Variety. March 15, 2007. Retrieved February 17, 2019. ^ a b "Press Conference: 'U2 3D'". Cannes Film Festival. Archived from the original on January 22, 2013. ^ a b Mühlbradt, Matthias; Axver, André. "U2 Vertigo Tour". U2gigs.com. Retrieved January 3, 2009. ^ "Revolver Entertainment and National Geographic Entertainment present a groundbreaking cinematic event from 3ality Digital" (PDF) (Press release). Revolver Entertainment and National Geographic Entertainment. Archived from the original (PDF) on February 5, 2010. ^ "2008 Sundance Film Festival to Feature Works of Several Avid Customers" (Press release). Business Wire. January 17, 2008. Archived from the original on February 27, 2017. Retrieved February 26, 2017. ^ a b c "Bluerock Editor Cuts U2 3D" (Press release). Dexigner. January 22, 2008. Archived from the original on 2011-09-10. Retrieved April 18, 2008. ^ "Photocall-Interview U2 3D". Cannes Film Festival. May 19, 2007. Archived from the original (video) on January 23, 2013. Retrieved June 2, 2009. ^ Kaufman, Debra (January 17, 2008). "Posting U23D in Stereo". Film & Video. Access Intelligence. Retrieved January 7, 2013. ^ Hope, Michele (March 1, 2008). "Storage solutions for fast-paced studios". Infostor. QuinStreet. Retrieved December 27, 2010. ^ a b c d e Van Buskirk, Eliot (January 21, 2008). "U2 3D Brings Hyperreal Arena Rock to the Multiplex". Wired. Archived from the original on November 4, 2014. Retrieved April 20, 2008. ^ a b "U2 in first ever 3D concert beamed live to a cinema near you". Gizmag. December 27, 2007. Retrieved January 4, 2008. ^ Leamy, John. "U2 3D movie poster" (PDF). U23Dmovie.com. National Geographic Society. Archived from the original (PDF) on July 17, 2011. Retrieved July 26, 2010. ^ "National Geographic Takes Home Highest Honors at GSCA Awards" (Press release). National Geographic Society. September 24, 2008. Retrieved January 9, 2013. ^ "Sneak Preview – U23D". U2.com. April 4, 2007. Retrieved February 26, 2009. ^ a b "National Geographic Cinema Ventures to Release 3ality Digital's 'U2 3D'" (Press release). National Geographic Society. October 29, 2007. Retrieved October 30, 2007. ^ "National Geographic Creates Entertainment Unit" (Press release). Business Wire. October 31, 2007. Retrieved January 8, 2013. ^ Souris (February 1, 2008). "Interview: John Fahey, CEO of National Geographic". U2 3D Live: The Official Blog for U2 3D, the Movie. National Geographic Society. Archived from the original on February 13, 2009. ^ "National Geographic Entertainment Names Best Buy as Exclusive Consumer Electronics Presenting Sponsor for U2 3D Theatrical Release in U.S." (Press release). Reuters. January 8, 2008. Retrieved February 26, 2017 – via The Free Library. ^ Souris (February 15, 2008). "U2 3D: 30-Second Spot". U2 3D Live: The Official Blog for U2 3D, the Movie. National Geographic Society. Archived from the original on December 19, 2009. ^ Souris (February 7, 2008). "U2 3D in Times Square Now!". U2 3D Live: The Official Blog for U2 3D, the Movie. National Geographic Society. Archived from the original on May 6, 2009. ^ Souris (February 25, 2008). "U23D on Track!". U2 3D Live: The Official Blog for U2 3D, The Movie. National Geographic Society. Archived from the original on January 22, 2010. ^ a b c Thompson, Anne (May 20, 2007). "U2 keeps sales in perspective". Variety. Retrieved February 17, 2019. ^ a b c d Chang, Justin (May 19, 2007). "U2 3D". Variety. Retrieved February 17, 2019. ^ "Official Selection 2007". Cannes Film Festival. Archived from the original on 2011-06-14. Retrieved June 1, 2009. ^ "3DFF Honors Disney's Up Movie In Closing Celebrations" (Press release). DesignTAXI. June 1, 2009. Retrieved January 8, 2013. ^ Howell, Peter (May 19, 2007). "U2 surprises at Cannes". Variety. Retrieved February 22, 2011. ^ "Beautiful Night in 3D". U2.com. May 20, 2007. Retrieved February 26, 2009. ^ Souris (January 20, 2008). "U2 3D Premieres at Sundance". U2 3D Live: The Official Blog for U2 3D, the Movie. National Geographic Society. Archived from the original on July 17, 2011. Retrieved February 8, 2008. ^ "U2 3D to Premiere in Dolby 3D at Sundance Film Festival" (Press release). Business Wire. January 17, 2008. Retrieved July 25, 2009. ^ "Two Advance Clips — U23D". U2.com. January 19, 2008. Retrieved August 4, 2010. ^ Myers, Michelle (January 17, 2008). "Sundance: Stars, snow, and social cyborgs". CNET. Retrieved April 14, 2015. ^ a b c d e "U2 3D: Summary". Box Office Mojo. Retrieved September 1, 2015. ^ a b McBride, Sarah (February 15, 2008). "Clash of the 3D Rock Stars". The Wall Street Journal. Retrieved August 4, 2010. ^ "The Spiderwick Chronicles: International Release Dates". The Spiderwick Chronicles. Paramount Pictures. Archived from the original on March 10, 2012. ^ a b Pomerantz, Dorothy (February 14, 2011). "On Top Of Grammy Miss, Bieber Comes Up Just Short At Box Office". Forbes. Retrieved March 21, 2011. ^ "Live from Chicago. Out Today!". U2.com. November 14, 2005. Retrieved March 24, 2009. ^ "New Video: Live in Milan". U2.com. November 23, 2006. Retrieved March 24, 2009. ^ a b Giardina, Carolyn (January 24, 2008). "'U2 3D' hopes to ride wave". The Hollywood Reporter. Archived from the original on April 5, 2011. ^ a b c Jordan, Isamu (February 29, 2008). "'U2 3D' great while it lasted". Spokane7. Cowles Publishing Company. Archived from the original on February 29, 2012. ^ "RealD 3D Brings U2 3D Home" (Press release). RealD 3D. February 21, 2008. Retrieved September 7, 2015. ^ Souris (February 21, 2008). "U2 3D Premieres in Dublin". U2 3D Live: The Official Blog for U2 3D, the Movie. National Geographic Society. Archived from the original on July 17, 2011. ^ a b "U2 3D: Weekly". Box Office Mojo. Retrieved September 1, 2015. ^ Lodderhose, Diana (April 11, 2008). "BFI London IMAX sets record with U2 3D". Screen Daily. Retrieved April 4, 2019. ^ a b "National Geographic Entertainment and 3ality Digital's 'U2 3D' Hits $20 Million in Box Office in Advance of Japan Opening" (Press release). Business Wire. February 25, 2009. Archived from the original on September 27, 2015. ^ "(No Title)". U2 3D Live: The Official Blog for U2 3D, the Movie. National Geographic Society. March 5, 2009. Archived from the original on July 17, 2011. ^ "Mobz inicia venda de ingressos para U2 3D" [Mobz starts ticket sales for U2 3D]. Cineclick (in Portuguese). February 18, 2011. Retrieved January 9, 2013. ^ a b "La película U2 3D regresa a 42 cines españoles siete años después de su estreno" [The movie U2 3D returns to 42 Spanish cinemas seven years after its release] (Press release) (in Spanish). Europa Press. September 22, 2015. Retrieved September 26, 2015. ^ Malcolm (October 15, 2009). "Rock Hall to screen U2 3D concert film to celebrate new theater". Akron Beacon Journal. Archived from the original on January 20, 2016. ^ "U2 3D". BoxOffice. Archived from the original on August 16, 2016. ^ "U2 3D (2008)". The Numbers. Retrieved March 30, 2016. ^ O'Neil, Tom. "Can 'Religulous' win an Oscar for Emmy's biggest loser Bill Maher?". Los Angeles Times. Archived from the original on August 23, 2016. ^ "U23D breaks box office records". RTÉ.ie. February 26, 2008. Retrieved May 20, 2008. ^ a b "U2 3D (2007)". Rotten Tomatoes. Retrieved December 4, 2018. ^ "10th Annual Golden Tomato Awards: Wide Release". Rotten Tomatoes. Archived from the original on May 8, 2014. ^ "U2 3D". Metacritic. Retrieved May 19, 2008. ^ a b Howell, Peter (May 19, 2007). "Even better than the real thing". Toronto Star. Retrieved May 19, 2008. ^ Black, Fergus (January 4, 2008). "U2 go 3D and it's even better than the real thing". Irish Independent. Retrieved May 19, 2008. ^ Griffin, Peter (April 18, 2008). "U2 3D even better than the real thing ... almost". The New Zealand Herald. Retrieved January 7, 2010. ^ Gundersen, Edna (January 25, 2008). "'U2 3D': Lifelike rattle and hum". USA Today. Retrieved May 19, 2008. ^ Greene, Andy (January 7, 2008). "'U2 3D' Premieres at New York Screening; Everybody Besides Jay-Z Impressed". Rolling Stone. Retrieved August 1, 2011. ^ Smith, Neil. "U2 3D (U)". Total Film. Retrieved June 13, 2008. ^ Phillips, Michael and Richard Roeper (January 19, 2008). "U2 3D". At the Movies with Ebert & Roeper. Season 8. ^ Seitz, Matt Zoller (January 23, 2008). "U2 3D (2007) – More Than Rock 'n' Roll: U2 on Tour in 3D Images". The New York Times. Retrieved January 8, 2013. ^ Baumgarten, Marjorie (January 2, 2009). "Screens Top 10s". The Austin Chronicle. Retrieved January 8, 2013. ^ Orndorf, Brian (December 31, 2008). "The 10 Best Films of 2008". OhmyNews International. Retrieved January 8, 2013. ^ Arnold, William (December 25, 2008). "Despite a dour 2008, Hollywood stayed busy – and so did moviegoers". Seattle Post-Intelligencer. Retrieved January 8, 2013. ^ Hardie, Giles (December 16, 2008). "The year's best films". The Sydney Morning Herald. Retrieved December 17, 2008. ^ Schulz, Mike (January 7, 2009). "Why So Serious? : Mike Schulz's 10 Most Enjoyable Movies of 2008". River Cities' Reader. Retrieved January 30, 2009. ^ "The 20 Best 3D Movies". Empire. Retrieved January 10, 2013. ^ Wood, Jennifer (January 3, 2013). "The 25 Best 3D Movies". Complex. Retrieved January 10, 2013. ^ Reed, Mark (March 18, 2010). "15 movies that aren't on DVD but should be"". Den of Geek. Retrieved February 14, 2018. ^ Hiatt, Brian (March 13, 2009). "U2 in Their Own Words". Rolling Stone. Retrieved August 1, 2011. ^ Hyden, Steven (January 24, 2008). "U2 3D". The A.V. Club. Retrieved March 19, 2009. ^ Keefe Rhodes, Nancy (April 13, 2008). "'U2 3D' Not the First IMAX Art Film: An Interview with Elka Krajewska". FilmSlash. Archived from the original on August 14, 2011. ^ Selvin, Joel (January 23, 2008). "Review: U2 larger than life in 3D documentary". San Francisco Chronicle. Retrieved January 8, 2013. ^ Adams, Derek (February 20, 2008). "U2 3D". Time Out London. Time Out. Retrieved June 11, 2008. ^ Gritten, David (February 22, 2008). "Film reviews: Rambo, U2 3D and more". The Daily Telegraph. Retrieved June 11, 2008. ^ Bradshaw, Peter (February 22, 2008). "U2 3D". The Guardian. Retrieved June 11, 2008. ^ "GSCA Presents Its 2008 Achievement Awards" (Press release). Giant Screen Cinema Association. September 15, 2008. Retrieved September 30, 2008. ^ "Grand Canyon Adventure and U2 3D Nominated for Visual Effects Society Award" (Press release). Giant Screen Cinema Association. January 26, 2009. Retrieved February 17, 2009. ^ "Winners of the 7th Annual VES Awards". Creative Planet Network. NewBay Media. February 21, 2009. Retrieved July 3, 2012. ^ "'U2 3D' Film Director Selected as SIGGRAPH 2008 Featured Speaker" (Press release). ACM SIGGRAPH. May 20, 2008. Retrieved August 26, 2008. ^ West, Steve (January 25, 2008). "U2 3D At Sundance". Cinema Blend. Retrieved June 24, 2009. ^ Slenske, Michael (December 1, 2011). "Dec 23: Pina". W. Retrieved March 5, 2017. ^ Talbott, Chris (October 18, 2013). "Muse gets unsettlingly close in new concert film". Yahoo! News. Associated Press. Retrieved February 26, 2017. ^ "Director's Cut". U2.com. July 15, 2010. Retrieved July 19, 2010. ^ "Rose Bowl concert on DVD". U2.com. March 30, 2010. Retrieved May 28, 2010. Wikimedia Commons has media related to U2 3D. This page was last edited on 10 April 2019, at 09:33 (UTC).